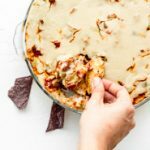 A healthier version of traditional layered refried bean dip – vegan, oil free, and gluten free. Perfect for game day! *if you want a more complex guac recipe try this one. A jar of mild (or medium if you like spicy) red salsa – I use Whole Food’s 365 brand. Tortilla chips for dipping. (This is my go to homemade tortilla chip recipe). Using a saucepan, heat the refried beans over low/medium heat. Add onion powder, garlic powder, black pepper, cumin, 2 tablespoons of vegan sour cream (optional for creamier consistency) and salt if needed. Mix with a spoon to combine all ingredients and until you reach a creamy consistency and then remove from heat. Set aside. Sour Cream: If you’re making your own homemade version – add all ingredients to a blender and mix until smooth and creamy. For best results – refrigerate sour cream for a few hours to allow it to thicken. If using store bought skip this step. Guac: In a small mixing bowl, add avocado flesh and lime juice and mix it up with a fork. Set aside. Make the cheeze: If you’re making the homemade cheeze (skip if using store bought) – add all ingredients to a blender and mix until smooth and creamy. Set aside. Preheat oven to 350F. Using an oven-safe dish (I used a round 9.5” glass dish) begin layering your dip as follows: Add refried beans first covering the entire base of the dish, then add sour cream, guac, shredded lettuce, salsa and finally the cheeze on top. Bake in the oven at 350F for 20 to 25 minutes, or until cheeze on top has reached your desired melty consistency. If you make the homemade cashew ‘cheeze’ alternative – Due to the tapioca, the liquidity cheeze will turn into a thicker consistency in the oven (as pictured) within 20 to 25 minutes, but if it still looks really liquidity leave for a few more minutes until a thicker consistency is reached.